This book gives the necessary background for understanding both the model theory and the mathematics behind the applications. 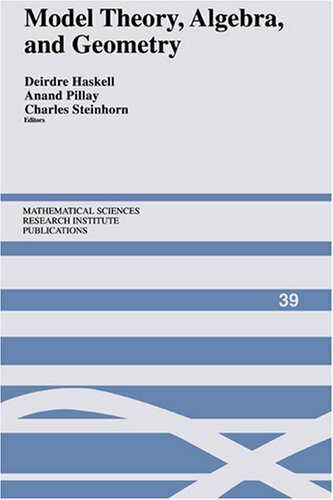 Aimed at graduate students and researchers, it contains introductory surveys by leading experts covering the whole spectrum of contemporary model theory (stability, simplicity, o-minimality and variations), and introducing and discussing the diverse areas of geometry (algebraic, diophantine, real analytic, p-adic, and rigid) to which the model theory is applied. The subject matter of this book constitutes a merging of several directions in general model theory: cardinality quantifiers; infinitary languages; and, finally, that on generalized quantifiers and abstract characterizations of first-order logic. This text provides the basic information about the metatheory of formal system. It will start with a brief information about propositional calculus and first-order logic. Then, fundamental theorems about elementary logic will be stated and proved. The purpose of this text is to give a thorough introduction to the methods of model theory for first order logic. Model theory is the branch of logic that deals with mathematical structures and the formal languages they interpret. This book provides an introduction to Model Theory which can be used as a text for a reading course or a summer project at the senior undergraduate or graduate level. It is a primer which will give someone a self contained overview of the subject.